An antibiotic is a drug that kills or prevents the growth of bacteria. Antibiotics have no effect on viruses, fungi, or parasites. They compose one class within the larger group called antimicrobials. (Antimicrobials include anti-viral, anti-fungal, and anti-parasitic drugs as well.) Antibiotics are relatively harmless to the host, and therefore can be used to treat infections. The term “antibiotic,” coined by Selman Waksman, originally described only those antibiotics derived from living organisms, in contrast to "chemotherapeutic agents," which are purely synthetic. 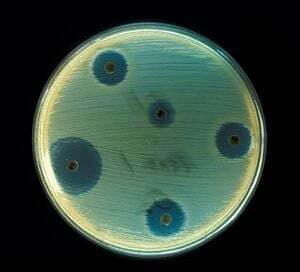 For example, there are antibiotics that are derived from mold, such as the penicillin class. Currently, the term "antibiotic" is also applied to synthetic antimicrobials, such as the sulfa drugs (drugs containing sulfur). Human creativity is expressed in the ability to identify and process natural agents and synthesize new antibiotics. Antibiotics are generally small molecules with a molecular weight less than two thousand. Unlike previous treatments for infections, which included poisons such as strychnine and arsenic, antibiotics were labeled "magic bullets": drugs which targeted disease without harming the host. Individual antibiotics vary widely in their effectiveness on various types of bacteria. The effectiveness varies with the location of the infection, the ability of the antibiotic to reach the site of infection, and the ability of the bacteria to resist or inactivate the antibiotic. Some antibiotics actually kill the bacteria (bactericidal), whereas others merely prevent the bacteria from multiplying (bacteriostatic) so that the host's immune system can overcome them. Oral antibiotics are the simplest approach when effective, with intravenous antibiotics reserved for more serious cases. Antibiotics may sometimes be administered topically, as with eye drops or ointments. Antibiotics can be categorized based on their target specificity: "Narrow-spectrum" antibiotics target particular types of bacteria, such as Gram-negative or Gram-positive bacteria, while "broad-spectrum" antibiotics affect a larger range of bacteria. Gram-positive and Gram-negative refer to whether the bacteria retain dye in the Gram staining protocol: Gram-positive retain dye and Gram-negative do not. Whether or not dye is retained is due to structural differences in the cell wall. Antibiotics can also be classified by the organisms against which they are effective and by the type of infection for which they are useful. The latter depends on the sensitivities of the organisms causing the infection and the accessibility of the affected tissue to the antibiotic. At the highest level, antibiotics can be classified as either bactericidal or bacteriostatic. Bactericidals kill bacteria directly whereas bacteriostatics prevent them from dividing. However, these classifications are based on laboratory behavior; in practice, both of these will end a bacterial infection. Many ancient cultures, including the ancient Egyptians, ancient Greeks and ancient Chinese, used molds and plants to treat infections. This treatment worked because some molds produce antibiotic substances. However, the active component in the molds was not distinguished or isolated by any of these ancient cultures. There also are many old remedies where mold is involved. In Serbia and in Greece, moldy bread was a traditional treatment for wounds and infections. Modern research on antibiotics began in Britain with the discovery of penicillin in 1928 by Alexander Fleming. More than ten years later, Ernst Chain and Howard Florey became interested in his work, and isolated the purified form of penicillin. The three shared the 1945 Nobel Prize in Medicine. "Antibiotic" was originally used to refer only to substances extracted from a fungus or other microorganism, but has come to include also the many synthetic and semi-synthetic drugs that have antibacterial effects. A common form of antibiotic misuse is failure to take the entire prescribed course of the antibiotic, usually because the patient feels better, but before the infecting organism is completely eradicated. In addition to treatment failure, these practices can result in bacterial resistance to the antibiotics, when some resistant bacteria survive the abbreviated treatment. Taking antibiotics in inappropriate situations is another common form of antibiotic misuse. Common examples of this would be the use of antibacterials for viral infections, such as the common cold. Currently, it is estimated that greater than 50 percent of the antibiotics used in the U.S. are given to food animals (e.g. chickens, pigs, and cattle) for prophylactic treatment in the absence of disease (Mellon et al. 2001). Antibiotic use in food animal production has been associated with the emergence of antibiotic resistant strains of bacteria, including Salmonella, Campylobacter, E. coli, and Enterococcus among others. There is substantial evidence from the United States and the European Union that these resistant bacteria cause antibiotic resistant infections in humans. The American Society for Microbiology (ASM), the American Public Health Association (APHA), and the American Medical Association (AMA) have called for substantial restrictions on antibiotic use in food animal production, including an end to all non-therapeutic uses. The food animal and pharmaceutical industries have fought hard to prevent new regulations that would limit the use of antibiotics in food animal production. For example, in 2000 the U.S. Food and Drug Administration (FDA) announced their intention to rescind approval for fluoroquinolone (a broad-spectrum antibiotic) use in poultry production because of substantial evidence linking it to the emergence of fluoroquinolone resistant Campylobacter (a type of bacteria) infections in humans. The final decision to ban fluoroquinolones from use in poultry production was not made until five years later because of challenges from the food animal and pharmaceutical industries. Some federal bills aimed at phasing out non-therapeutic antibiotics in U.S. food animal production have been endorsed by various public health and medical organizations, including the American Nurses Association (ANA), the American Academy of Pediatrics (AAP), and the American Public Health Association (APHA). Excessive use of prophylactic (preventive) antibiotics in travelers may also be classified as misuse. The production of antibiotics has been widespread since the pioneering efforts of Howard Walter Florey and Ernst Boris Chain in 1939. The importance of antibiotics to medicine has led to much research dedicated to the discovery and production of them. Despite the wide variety of known antibiotics, less than one percent of antimicrobial agents have any medical or commercial value. The most commonly known antibiotic, penicillin, has a highly selective toxicity and therapeutic index (as eukaryotic animal cells do not contain peptidoglycan—a.k.a. 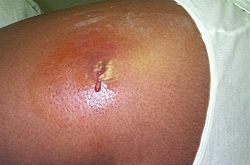 murein, a polymer consisting of sugars and amino acids—they are usually unaffected by it). This is not so for many antibiotics. Others simply lack advantage over the antibiotics already in use, or have no other practical applications. In order to identify the useful antibiotics, a process of screening is often employed. Using this method, isolates of a large number of microorganisms are cultured and then tested for production of diffusible products that inhibit the growth of test organisms. However, most of the resulting antibiotics are already known and must therefore be disregarded. The remainders must be tested for their selective toxicities and therapeutic activities, and the best candidates can be examined and possibly modified. A more modern version of this approach is a rational design program. This involves using screens to find new natural products that inhibit specific targets (e.g. a particular step of a metabolic pathway) in microorganisms, rather than tests to show general inhibition of a culture. Antibiotics are produced industrially by a process of fermentation, where the source microorganism is grown in large containers (100,000–150,000 liters or more) containing a liquid growth medium. Oxygen concentration, temperature, pH, and nutrient levels must be optimal, and are closely monitored and adjusted if necessary. As antibiotics are secondary metabolites (metabolites not involved in normal development), the population size must be controlled very carefully to ensure that maximum yield is obtained before the cells die. Once the process is complete, the antibiotic must be extracted and purified to a crystalline product. This is simpler to achieve if the antibiotic is soluble in organic solvent, as the antibiotic could be separated in this way from other components that are soluble instead in aqueous solvent. Otherwise it must first be removed by ion exchange, adsorption, or chemical precipitation (all of which are separation techniques that exploit a specific chemical property of the molecule of interest). Microorganisms used in fermentation are rarely identical to the wild type. This is because species are often genetically modified to yield the maximum amounts of antibiotics. Mutation is often used, and is encouraged by introducing mutagens such as ultraviolet radiation, x-rays, or certain chemicals. Selection and further reproduction of the higher yielding strains over many generations can raise yields by 20-fold or more. Another technique used to increase yields is gene amplification, where copies of genes coding for proteins involved in the antibiotic production can be inserted back into a cell, via vectors such as plasmids. This process must be closely linked with retesting of antibiotic production and effectiveness. Use or misuse of antibiotics may result in the development of antibiotic resistance in the infecting organisms, similar to the development of pesticide resistance in insects. The concept of genetic selection requires that as close as possible to 100 percent of the infecting organisms be killed off to avoid selection of resistance; if a small subset of the population survives the treatment and is allowed to multiply, the average susceptibility of this new population to the compound will be much less than that of the original population, since they have descended from those few organisms that survived the original treatment. This survival often results from an inheritable resistance to the compound, which infrequent in the original population but is now much more frequent in the descendants selected entirely from those originally infrequent resistant organisms. Antibiotic resistance has become a serious problem in both the developed and underdeveloped nations. By 1984, half of the people with active tuberculosis in the United States had a strain that resisted at least one antibiotic. In certain settings, such as hospitals and some child-care locations, the rate of antibiotic resistance is so high that the normal, low-cost antibiotics are virtually useless for treatment of frequently seen infections. This leads to more frequent use of newer and more expensive compounds, which in turn leads to the rise of resistance to those drugs. A continuous race to discover new and different antibiotics results, in an attempt to keep from losing ground in the battle against infection. The fear is that we will eventually fail to keep up in this race, and that people may again face life-threatening bacterial infections. 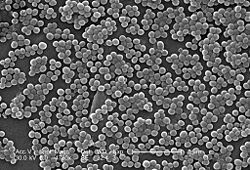 Another example of selection is Staphylococcus aureus, which could be treated successfully with penicillin in the 1940s and 1950s. 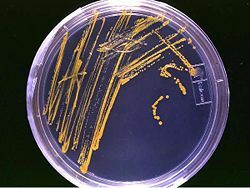 At present, nearly all strains are resistant to penicillin, and many are resistant to nafcillin, leaving only a narrow selection of drugs, such as vancomycin, useful for treatment. The situation is worsened by the fact that genes coding for antibiotic resistance can be transferred between bacteria, making it possible for bacteria never exposed to an antibiotic to acquire resistance from those which have. The problem of antibiotic resistance is worsened when antibiotics are used to treat disorders in which they have no efficacy, such as the common cold or other viral complaints, and when they are used widely as prophylaxis rather than treatment (as in, for example, animal feeds), because this exposes more bacteria to selection for resistance. Possible side effects to antibiotics are varied, and range from fever and nausea to major allergic reactions. One of the more common side effects is diarrhea, sometimes caused by the anaerobic bacterium Clostridium difficile, due to the antibiotic disrupting the normal balance of intestinal flora (UMHS 2005). Other side effects can result from interaction with other drugs, such as elevated risk of tendon damage from administration of a quinolone antibiotic with a systemic corticosteroid (a type of medicinal steroid). It is a common assertion that some antibiotics can interfere with the efficiency of birth control pills. There are a few known cases of complication; however, the majority of antibiotics do not appear to interfere with oral contraception (PP 2006). Unfortunately, the comparative ease of finding compounds that safely cure bacterial infections has proved much harder to duplicate with respect to fungal and viral infections. Antibiotic research led to great strides in our knowledge of basic biochemistry and to the current biological revolution; but in the process it was discovered that the susceptibility of bacteria to many compounds that are safe to humans is based upon significant differences between the cellular and molecular physiology of the bacterial cell and that of the mammalian cell. In contrast, despite the seemingly huge differences between fungi and humans, the basic biochemistries of the fungal cell and the mammalian cell are relatively similar; so much so that there are few therapeutic opportunities for compounds to attack a fungal cell that will not harm a human cell. Similarly, we know now that viruses represent an incredibly minimal intracellular parasite, being stripped down to a few genes worth of DNA or RNA and the minimal molecular equipment needed to enter a cell and actually take over the machinery of the cell to produce new viruses. Thus, the great bulk of viral metabolic biochemistry is not merely similar to human biochemistry, it actually is human biochemistry, and the possible targets of antiviral compounds are restricted to the relatively very few components of the actual virus itself. Research into bacteriophages is ongoing at the moment. Bacteriophages are a specific type of virus that only targets bacteria. Research suggests that nature has evolved several types of bacteriophage for each type of bacteria. While research into bacteriophages is only in its infancy, the results are promising and have already led to major advances in microscopic imaging (Boutin 2006). Phage therapy has been used in the past on humans in the United States and Europe during the 1920s and 1930s; however, due to not fully understanding the mechanism by which phage therapy worked, these treatments had mixed results. With the discovery of penicillin in the 1940s, Europe and the United States changed to using antibiotics. However, in the former Soviet Union, phage therapies continued to be studied. In the Republic of Georgia, the Eliava Institute of Bacteriophage, Microbiology & Virology continues to research the use of phage therapy. Various companies and foundations in North America and Europe are currently researching phage therapies. Boutin, C. 2006. “Biologists build better software, beat path to viral knowledge.” Purdue University News (February 1, 2006). Retrieved January 6, 2007. Planned Parenthood (PP). 2004. “Does taking antibiotics make the pill less effective?” Planned Parenthood: Ask Dr. Cullins (July 15, 2004). Retrieved January 6, 2007. Mellon, M. et al. 2001. Hogging It! : Estimates of Antimicrobial Abuse in Livestock, 1st ed. Cambridge, MA: Union of Concerned Scientists. University of Michigan Health System (UMHS). 2005. Antibiotic-Associated Diarrhea. McKesson Provider Technologies. Retrieved November 26, 2006.